It wasn’t supposed to happen, and the police recently imposed safety guidelines so it won’t happen again, but last summer something went terribly wrong at the Cody gunfight. On July 29, 2016, twelve actors gathered on 11th Street for the nightly show that mimics Old West shootouts, a summertime tradition. The crowd waited for the show with anticipation, but what they got that night, no one expected. The performers took to the streets, six guns blazing, then tragedy struck. During the gunfight, performers fire guns loaded with blanks. On that night last July, though, one of the actors fired live rounds that struck the crowd, injuring three spectators. Cody law enforcement later arrested and charged gunfight performer Steve Winsor, revealing in an affidavit that they found a live round in Winsor’s gun as it was inspected. Winsor has not yet entered a plea on five misdemeanor charges resulting from the shooting, the Park County, Wyoming, Attorney’s Office told the Pioneer. His trial date is set for July 13 with a pretrial conference on June 26. Winsor’s prior criminal history includes gunplay and dates back to the mid 1990s. Richard Muscio, President of the Cody Gunfighters, recalled what happened that night. Muscio said one of the actors playing a bad guy usually walks by fanning his pistol as he passes in front of the other actors. “We would shoot him down and he would fall to the ground”, Muscio said. At the point in the show when this took place last July, initially there was no indication to the actors that anything was wrong. “Then all of a sudden a police car shows up with an ambulance out front. We were wondering, ‘What’s going on?’,” said Muscio. In February, the Cody Enterprise reported details of the affidavit from the Cody Police Department’s Investigation of the gunfight. “Steve Winsor, one of the participants in the show, inadver-tently loaded his revolver with live rounds and fired them in the direction of spectators who were wounded during the July 29 show. Winsor faces five misdemeanor counts of knowingly pointing a firearm at or in the direction of others,” the affadavit stated. The July 2016 incident was not the first time Winsor was involved with illegal gunplay or had run afoul of the law in Park County, Wyoming, according to a report filed by the Cody Police Department. In January 2015, witnesses claimed Winsor threatened a man with death using Old West style handguns. Law enforcement reduced Winsor’s original felony charge to misdemeanor reckless endangerment after a plea agreement. Winsor was then sentenced to a year of probation. Winsor’s criminal history dates to the mid 1990s, when a Park County court convicted him for selling a gram of methamphetamine to a police informant, for which he received a sentence of five years probation. At that time, Winsor was on probation as the result of a previous charge of reckless endangerment. Subsequently, Winsor appeared several times before Park County courts in hearings related to probation violations due to failed drug tests. In Laramie County, Wyoming, in July 1999, he plead guilty to domestic violence, and in June of 1999 Laramie County law enforcement cited Winsor on a concealed weapon charge. According to the same report, the third shooting victim witnessed what happened to the man and his daughter. He told the Enterprise, he saw a man about 10 feet in front of him turn in his direction. He could see blood on the man’s shirt and the girl began crying. The man also reported he had heard bullets whizzing by and was shot in both calves. Regarading how it happened that Winsor fired live rounds, Muscio described the type of revolver used and how it’s loaded. “It was a cap and ball cylinder. You can’t just reload those in the middle of the street. You have to change cylinders,” said Muscio. Loading a cap and ball cylinder requires that a measured amount of black powder be poured inside each chamber. A lead ball is then pressed in the chamber. Due to the time required to reload, those who use this type of cylinder typically preload several ahead of time. This was the case with Winsor. “Winsor used a second cylinder for the final shootout. That one happened to have live rounds,” Muscio said. Muscio explained that Winsor had been target shooting the day before. He had a few cylinders with him the night of the show. Once loaded, cylinders with blanks and those with live rounds appear identical. Muscio said Winsor firing live ammunition instead of blanks was an accident. A police investigation immediately followed the incident, ending the nightly performance for the duration of the summer. Tourists and residents now await the return of The Cody Gunfighters this summer(see editor’s note*, the 2017 gunfights were canceled). As a new season approaches, the Gunfighters are enforcing new safety precautions at the direction of the Cody Police. Ken Martin has been involved with the show since the beginning. This season, he will be working as the show’s safety coordinator, addressing their previous failure to both vet the gun weilding participants and their firearms. Muscio also said the city requires that the gunfight obtain two permits for the show every year—a permit allowing them to block off a section of Sheridan Avenue, and a second permit that allows them to discharge firearms within city limits. Muscio said the city has approved those permits for the upcoming season. Summer 2017 marks The Gunfighters 21st year. The group began performing in the late 70s and discontinued after a few seasons. Then, in 1995, the group began anew under the name “The Cody Gunslingers.” Since 2000, the group has been performing as “The Cody Gunfighters” and is a registered nonprofit with the state of Wyoming that donates a portion of their proceeds to local charities. Muscio has been involved with the cast since 1995. He said he enjoys being a part of the show, even after last year’s debacle and all the years the gunfight has operated, because he is an Old West history buff. “I like to keep myself up to speed on (the historical aspects) as much as I can”, he said. Muscio said the format of the show attracts about 50-thousand people every year. Ken Martin also said the show continues to be a major draw for summer crowds. Nightly gunfights kick off at 6:00 p.m. west of the Irma Hotel, downtown Cody, June 1 – Sept. 30—safety protocols in place. 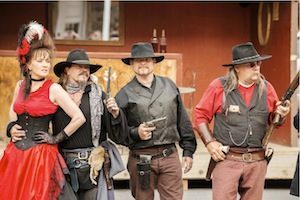 Unable to find an insurance carrier willing to assume the unique risks associated with The Cody Gunfighters, the 2017 summer performances were canceled. In another related development, Steve Winsor was arrested in early April 2017 for Illegal Possession of a Controlled Substance, Methamphetamine, and Bond Violation.